Over 50 years ago, Martin Luther King Jr. started organizing what would become his final major campaign for political equality, which would bring over 3,000 people to live in a tent city built on the National Mall. 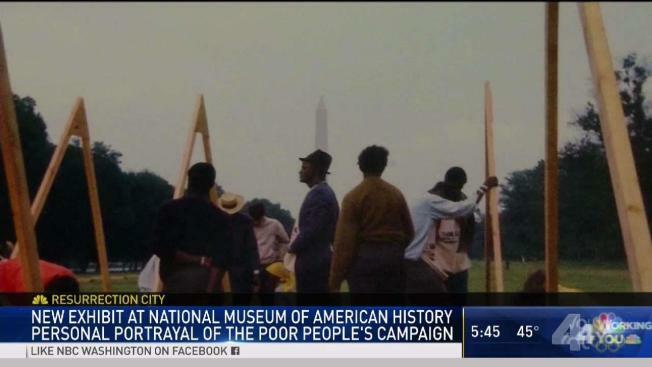 Now, the Smithsonian is commemorating the Poor People's Campaign with an exhibit including never-before-seen photos and more. News4's Kristin Wright reports. Over 50 years ago, Dr. Martin Luther King Jr. started organizing what would become his final major campaign for political equality, which would bring over 3,000 people to live in a tent city built on the National Mall. King was assassinated days before The Poor People’s Campaign undertook its massive, weeks-long protest against poverty in America. But organizers still brought his vision to life: A multicultural, anti-poverty movement that pressured Congress to raise wages, expand health care access and create jobs. Over the course of two weeks in 1968, activists built 540 tents on the National Mall, where men, women and children would eat, sleep and campaign for better social services for Americans of all skin tones and backgrounds. The activists stayed for 43 days before police cleared them out, arresting 337 people in the process, according to Smithsonian documents. African Americans, poor whites, indigenous people and Latinos were all represented. Many came in caravans from all over the country, weathered several inches of rain, walked through the Lincoln Memorial reflecting pool and played music together, according to pictures released by the Smithsonian. The settlement was called Resurrection City, and a new Smithsonian exhibit seeks to connect modern Americans to a sometimes overlooked movement. The exhibit is sponsored by the Smithsonian’s National Museum of African American History and Culture, but you can visit the artifacts at the American History Museum. There, you’ll find lapels, murals and parts of tents that made up the temporary dwellings on display. The exhibit also features newly printed and never-before-seen photographs of the demonstration. To get a sense of how people lived in Resurrection City -- which had it’s own zip code, a Head Start program, medical and dental facilities and a dining tent that served over 180,000 meals -- you also can watch a documentary showcasing footage from the demonstration. The exhibit opens on Martin Luther King Jr. Day, which is Monday. You’ll have a year to check it out before it’s gone, possibly for a nationwide tour.